The titular Chef and Father is Greg Johnson, a Seattle-area father of two daughters, professional chef, and backyard gardening enthusiast. Greg genuinely wants you to take the time to make your own baby food not because it's trendy or even because it's cost-effective (although it is in the long run! ), but because he thinks families need to regain the quality time spent around the table: "I truly believe the dinner table is where we can make significant change for the future. We can help our kids have the values and beliefs and the core systems that will make the future world a better place. It's the memory of a family meal that sticks with you for the rest of your life." Chef and Father Vol. 1 introduces the equipment and baby food basics, covering the preparation of various first foods from butternut squash, apples and pears, basic grains and steamed veggies through more complex vegetable purees. I love that Greg winds the DVD up with a recipe for the grown-ups using several of the purees you made for baby- grilled pork chops with pureed squash and apples. It looks not only tasty but reasonably achievable, no matter how sleep deprived you are. I also love the fact that Chef and Father is equally approachable for mothers and fathers. My husband is in the kitchen at least as much as I am, so it's nice to see another daddy cooking for his kids. And wife! 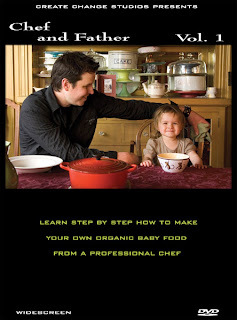 Click here to buy Chef and Father, Vol. 1 for $19.99. Hurray for a hometown chef! What a great idea. I couldn't agree more with him, "I truly believe the dinner table is where we can make significant change for the future." I'm going to have to check this out--we will be starting solids soon and I will be attempting to make our son's own food! It looks like a great movie. What is the "run time"? Lately, I just don't have time for long films, but this topic is certainly of interest.